Many of the projects implemented by Ca’ Foscari University of Venice are to make more sustainable campuses and management, but also to integrate sustainable issues in teaching and research. In the last few years the University decided to use art as an instrument to promote sustainability, to engage and educate students and community. The artwork “Dancing Solar Flowers”, by the artist Alexandre Dang, was one of the most successful experiences realised in terms of involvement in sustainability matters. 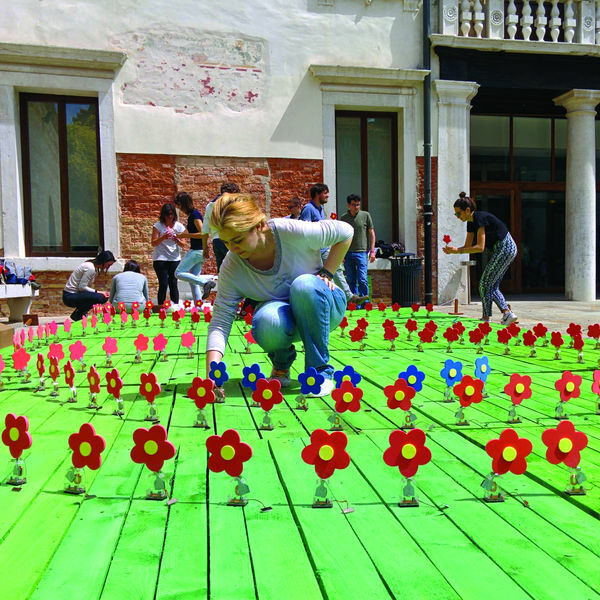 The installation, displayed from 7 May till 22 November 2015 in the Ca’ Foscari main courtyard, consisted of an artificial field made by reused pallets, where we “planted” hundreds of flowers dancing thanks to the sun light. Further, this project connected some of the main research and teaching fields of Ca’ Foscari; staff and students have been involved in the setting-up of the installation and in the development of research materials related to the artwork. 1. The active involvement in the project motivated students also to promote peer engagement on other initiatives regarding sustainable issues and allowed them to put into practice their own cross competencies by actively working on the project. 2. Developing a project which arouses the people’s curiosity, in order to push them to know more and to increase awareness of problems related to human behaviours and allowing the diffusion of sustainable solutions. 3. Creating projects in connection with the city and territory.